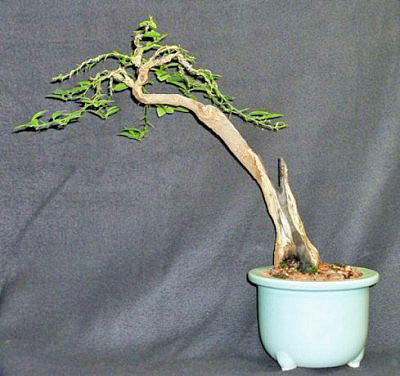 Bonsai, an "art" or a "craft?" Picture by Tom Simonyi. Posted with permission. A young lady in a writer's group on Facebook was surprised that I referred to bonsai as an "art." (She was polite about it.) She thought of bonsai as a "craft." I could think of no better way to try to convince her, under the circumstances, than to post this picture. This tree is a Key lime (Citrus aurantifolia) that belongs to Tom Simonyi of Morgantown, WV. It was Tom's first bonsai ever, and he's been working with it for over 25 years now. If you would like to see earlier images of this tree, and know more of its history, please visit these two links: Never quite finding the key to key lime, and Key Lime transition. The first one gives the earlier story of this tree, the second is up-to-present-time. Bonsai Vault will require you to register (for free) to see the pictures, but if you're interested in bonsai (and especially if you're interested in tropicals,) I think it's worth it. Austrian pine, far right. Standard US 12-oz beverage can for size reference. 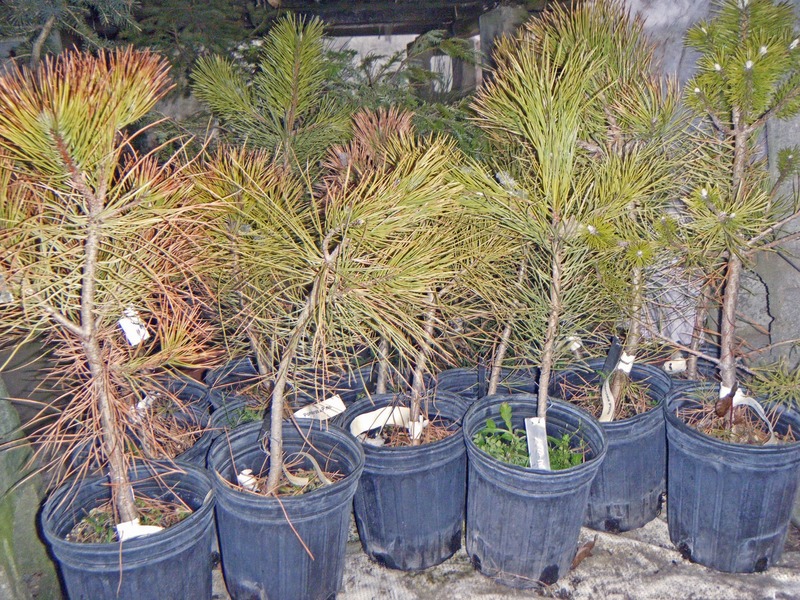 A number of them have needles that are browning toward the tips; but that's not unusual here in young pines that have sat in a garden center all season, often overwatered. All 14 have fat, healthy buds for next spring, so I'm not worried about them. 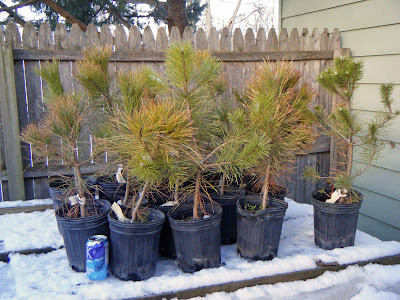 All 14 will have no problem overwintering with my hardy trees; their species are fully cold-hardy here. Tucked in under the Rack with the other hardy trees. I bought these trees aiming to develop them into good raw material for bonsai. (That's why I wanted them young and small: so there will be less to correct.) 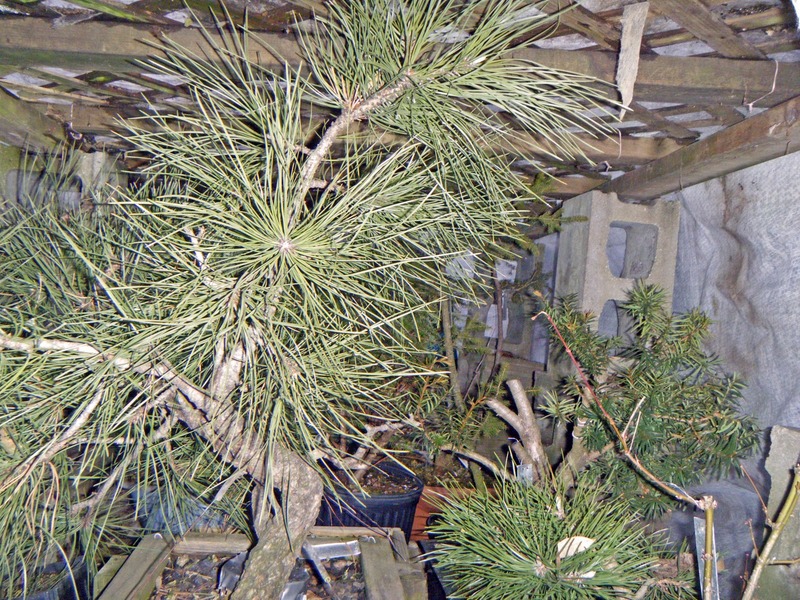 Northern Indiana simply has no good sources of raw material for non-tropical bonsai. The closest bonsai nurseries are all more than 100 miles away. One must buy bonsai stock on-line, or else shop in a general-purpose nursery. Good bonsai candidates can be found in general-purpose nurseries, but one has to know what to look for. Even then, one good find in 100 nursery visits is about the best average success rate that can be expected, in my experience. 1-gal. Rootmaker®. 7 inches on each side at top. Inside closeup of Rootmaker®. Click to enlarge. In spring, each of these trees will be repotted into a 1-gallon Rootmaker ® growing pot. The Rootmaker® is designed to promote the development of a compact fibrous-root system, close to the trunk. Let me describe briefly how it does that. In a typical round nursery pot, the roots grow outward until they hit the sides of the pot; then they grow down to the bottom, where they circle round and round. Fibrous feeder roots are usually found only near the ends of the long circling roots. In a Rootmaker®, the roots grow out until they encounter the sides of the pot, then start down, just as in a standard pot. 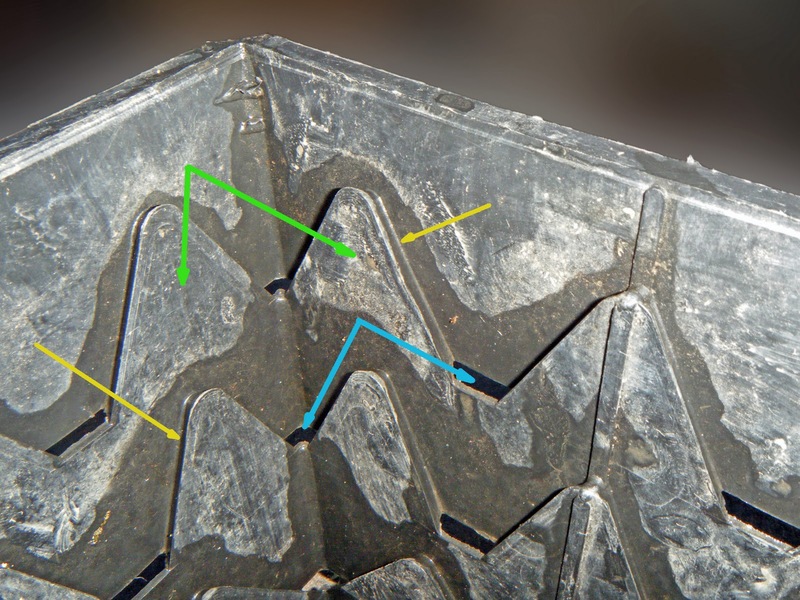 But the sides of the Rootmaker® are designed with rows of shallow triangular steps (green arrows in the picture.) The edges of each step are designed to create a little channel on each side, along the inside of the pot wall (yellow arrows.) Those channels guide the root tips to holes in the sides of the pot (blue arrows,) where they emerge into the air, dry and die. The plant seals off the dead tips, keeping out pathogens, and the roots respond by branching further back, where they're still inside the soil mix. The end result is a well-branched, compact root system close to the base of the tree. I've been using Rootmakers® for a number of years now. 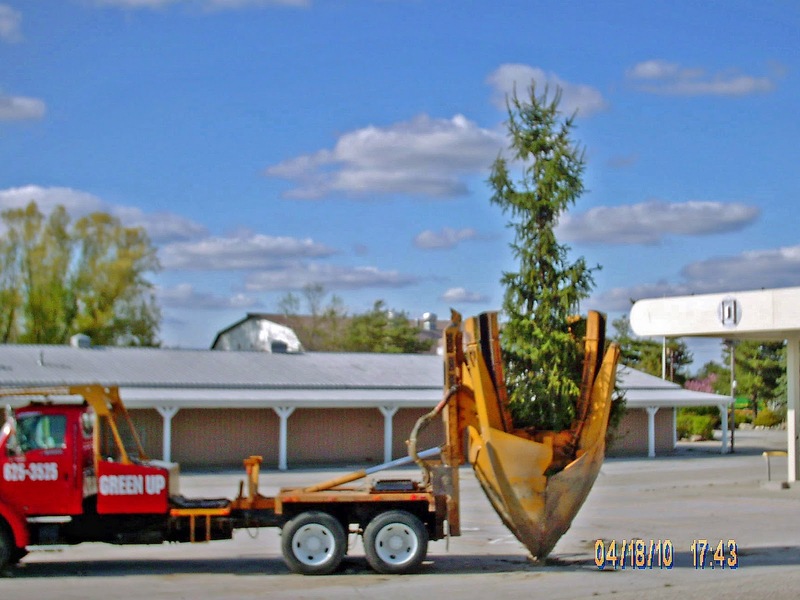 They don't work well with exceptionally vigorous growers, like willows and Ficus: the roots grow so fast that they quickly block the air-pruning holes. 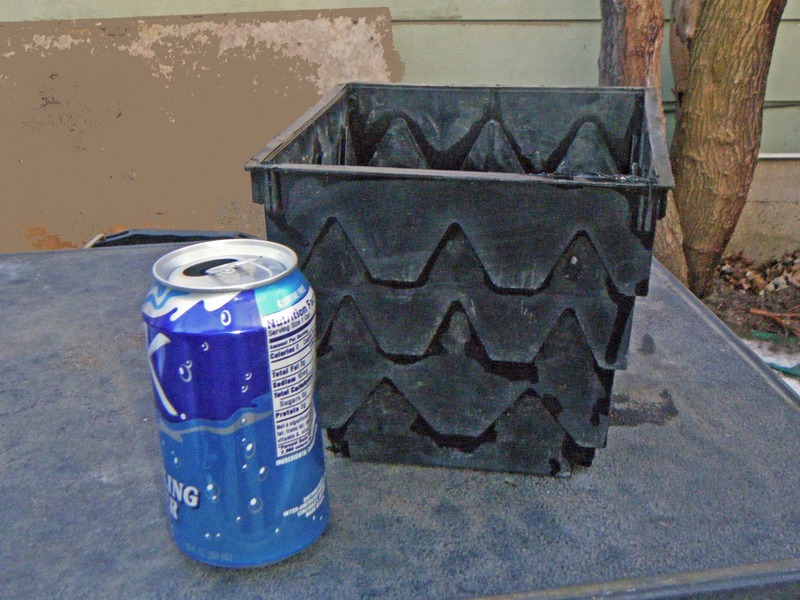 Otherwise, I have found these pots to work as they are meant to, and I am happy to recommend them. My Rootmakers® are an older model, but the company is still in business. You can learn more at www.rootmaker.com. 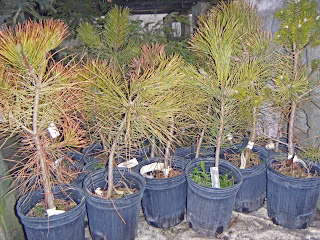 Each of these pines will spend at least two years in a Rootmaker®, then be moved up to a larger growing pot. Most of them will be shaped enough to put some movement into their trunks. They'll be fertilized regularly, and pruned and pinched in such a way as to encourage low, compact branching. If all goes as hoped, in three to five years each one will be a nice piece of bonsai raw material, ready to be styled or grown on further, as a new owner may decide. I plan to offer them for sale when they're ready, starting with local bonsai practitioners. That's the plan, anyway. I expect to learn new things along the way. Check back in a few years! 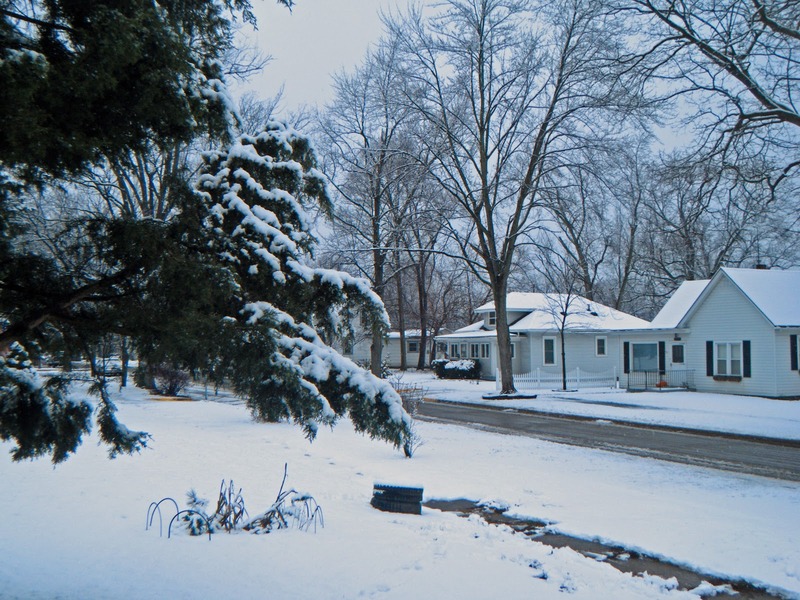 For friends elsewhere, only one thing is predictable about the weather in northern Indiana, and that is unpredictability! Christmas Day was dry, with no snow and temperatures a little above freezing. Last nite the snow that the kids had been hoping for finally arrived, and enough of it for a few pictures. Hope you enjoy them! Across the street and angled west, from our front door. 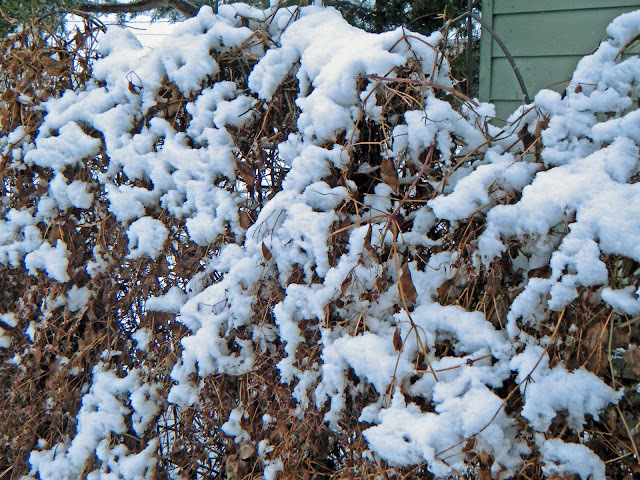 Snow on the dried stems of the sweet autumn clematis. 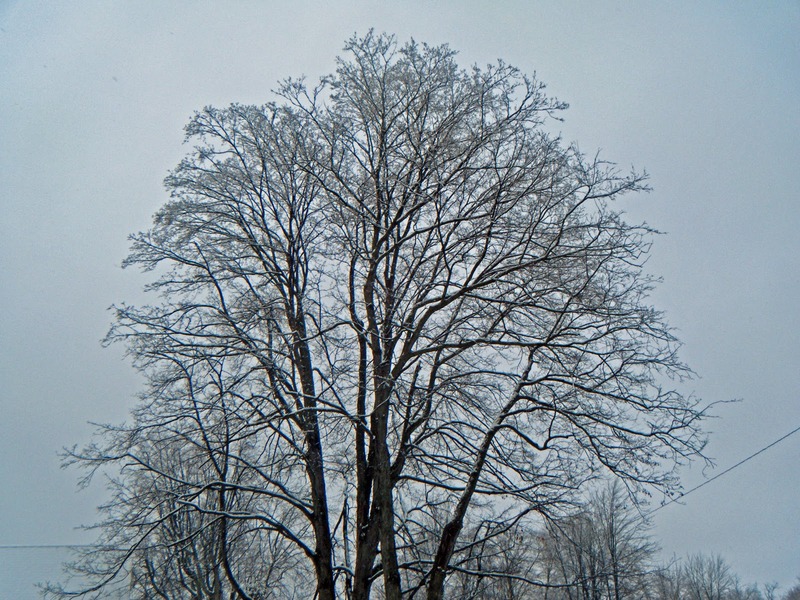 Silver maple against the sky. I like this best of all today's pictures. Before trim and repotting. 12-25-11. This elephant bush (Portulacaria afra) belongs to my daughter. Repotting it was a nice little Christmas Day project for the two of us. She did most of the work (and made most of the decisions,) with assistance from me as needed. There's a story connected with this little elephant bush. I bought it for my daughter in the summer of 2006, when she was six. If she had any natural interest in, or aptitude for, the art of bonsai, I wanted to encourage it early. 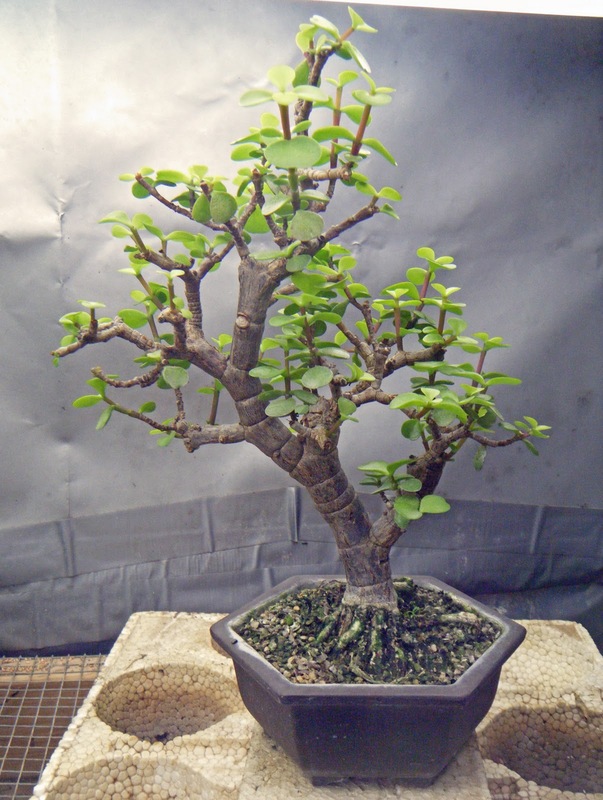 Portulacaria is a good starter plant for a child: a desert plant, it's very forgiving of neglect; and it grows quickly, so results are seen relatively soon. When the time came to move it into a proper bonsai pot, we had a 180-degree difference of opinion about where the front should be. I mean that literally: her choice of front was my choice for the back! Since I'm the parent, tho, and the one with the bonsai experience, there wasn't much question: my choice of front prevailed. Trimmed and repotted; same pot. 12-25-11. In August of 2008, I took my daughter's tree along to a Styling and Refinement workshop with Mr. Susumu Nakamura at the Mid-America Show in Chicago. Mr. Nakamura, an internationally-renowned bonsai master who has done a great deal to promote the art of bonsai around the world, is still a very helpful and approachable man. I set my daughter's bonsai in front of him -- with the front toward him, of course -- and asked for his comments. He immediately reached out both hands and rotated the pot 180 degrees. "Make this the front," he said, "tilt it a little this way, plant tree a little more to this side, and -- perfect!" That was his word: "perfect." Lesson learned! A child can have a good artistic sense and a good eye for design, even when young. I'd made a mistake when I dismissed my daughter's opinion without any more consideration than I gave it. And of course, my daughter was delighted when I told her that a very experienced bonsai master had agreed with her about which side should be the front! She's still liable to remind me of that incident when we have a difference of opinion on design. But she does it nicely. Merry Christmas and a very prosperous New Year 2012 to all! Permit me to offer a quote from G.K. Chesterton: "...the hands that had made the sun and the stars were now too small to reach the great heads of the cattle. Upon this paradox, we might almost say upon this jest, all the literature of [the Christian] faith is founded." From Steve, Princene, and NaevEnya; two dogs, two cats; and trees too numerous to mention! The Glencormac Yew, near Kilmacanogue, Co. Wicklow, Ireland, is the oldest yew I have personally seen. Core samples have established that it sprouted right around the time of Christ's birth. 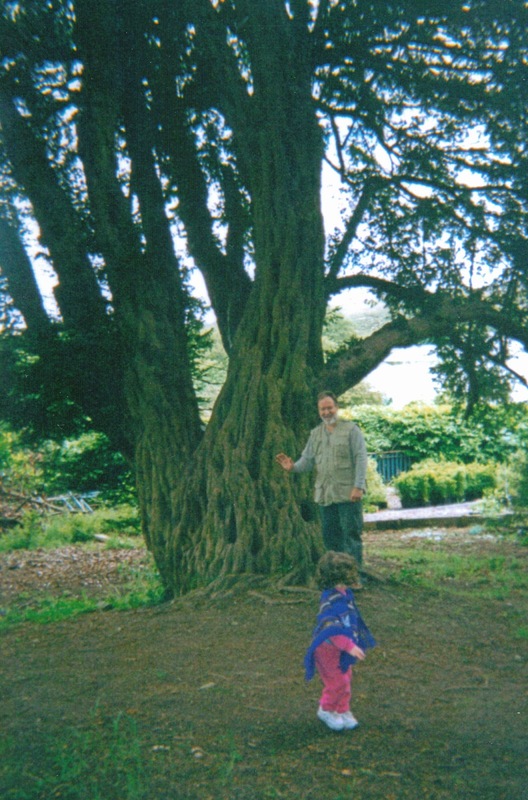 It was well over a millennium-and-a-half in age when a yew allée was planted with this tree as an anchor at one end. That's my daughter and me beside it in this 2002 picture taken on my basic film camera. I admit I was a bit surprised that my little scanner reproduced it as well as it did. Hope you enjoy it! "Now we just have to find the right pot!" 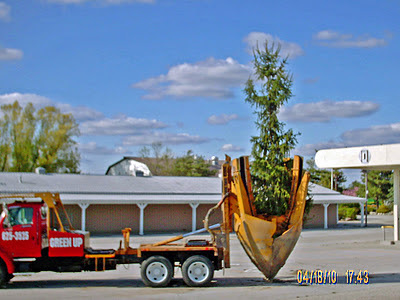 Michael Hagedorn has posted an article worth a read by any grower of Japanese maples. You can find it at: http://crataegus.com/2011/11/29/read-this-if-you-grow-japanese-maple/. If you find it useful, please leave Michael a "Thank you" in the Comments. Serissas and cold; the experiences of two friends. In an earlier post, "Serissas: Finding the limits on cold," I mentioned two other men who are experimenting with the cold-hardiness of serissa. Carl Rosner lives in New Jersey, on the border between USDA Zones 6 and 7. This means that in a "typical" winter, he will see temperatures in the single digits F (roughly -12° to -17° C) from time to time, with the occasional dip to -5° F (-20.5° C.) Carl overwinters his serissas outdoors. Yes, outdoors. Carl's custom is to bury a serissa up to the first branches in the garden. (I believe he picks spots sheltered from wind.) 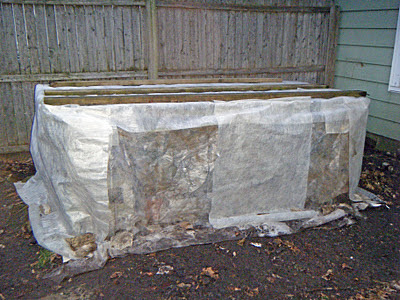 Then he covers the rest of the plant -- the whole thing -- with mulch, and leaves it until spring. His serissas not only survive, they thrive! They reward him with a profusion of blooms every spring (I've seen pictures,) and seedlings from time to time. Bill Swain lives in western Massachusetts state, in the milder half of USDA climate Zone 5: in a "typical" winter, Bill can expect the temperature to get down to -15° F (-26° C) at least once. In 2010, Bill took three serissas (ones he could afford to lose,) and planted them outside in sheltered spots. Two were the species (Serissa foetida,) and one was the 'Snow Rose' cultivar. When winter came, he mulched them heavily and left them alone. I, frankly, did not expect them to survive, and I think Bill really didn't either. Two of Bill's in-ground serissas made it thru! Those two were the species serissas; the 'Snow Rose' perished. Bill reported that the foliage and all the fine twigs died during the winter; but the thicker stems started putting out new growth in mid-spring. To say I was astounded is an understatement! I'm next. 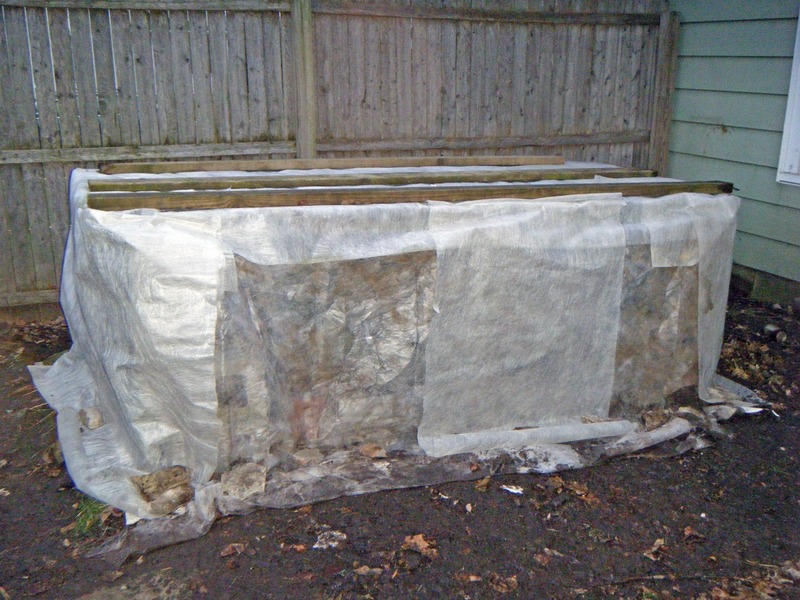 I told Bill that if his serissas made it thru the winter somehow, I would repeat his experiment in 2012 (or maybe 2013; I want them pencil-thick.) My climate is a bit colder than western Massachusetts, so we shall see. Stay tuned! This weekend I finally got my fully hardy trees tucked in for winter. I had hoped to have this done three weeks ago, but such is life. There's room for a few more, actually. Under the covering. Cans of mothballs discourage critters. Once the trees are under the shelter, I cover the whole thing with a "spun-bonded" fabric from DuPont; they sell it for a row cover. It transmits probably 50% of light and reflects the rest, lets water thru slowly, and is advertised to provide "7° F of frost protection." (I'm not entirely sure what that last means; I'd like to think it means the temperature under the fabric stays 7° F warmer than the air outside, but I'm not sure.) My supply of this fabric is getting low; I had to do some piecing to get everything covered. Next year I'll have to look for a supplier, or find a substitute. I'm not sure DuPont even makes this fabric any more. The fabric is stapled to the lattice and frame. Stones around the perimeter hold the skirts of the cover down; the pieces of lumber on top are simply for weight, in case of unusual wind. This spot doesn't get much wind, tho: the house and an extension thereof shelter it on two sides; there's the fence on another side, and an old shed (out of sight to the left) on the fourth. Last February we had one nite of true blizzard conditions (as defined by the US Weather Service,) and I don't think winds in the back yard got much above 15 mph! Two trees, a Colorado spruce (Picea pungens) and a "northern white cedar" (Thuja occidentalis,) are too tall to fit under "the rack;" they overwinter in a sheltered nook nearby, along with some children's play equipment and my ladder. This weekend I plan to go to a friend's property and collect a couple of bushels of fallen pine needles, with which to mulch them. Both trees are still in development. I live in the US Dept. 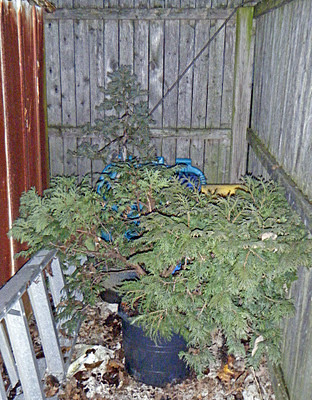 of Agriculture's climate zone 5a; this means that in a "typical" winter, we should be ready for at least one nite when the temperature gets down to between -15° and -20° F (-26° to -29° C.) For my non-bonsai friends, a shelter like mine is not meant to keep the trees from freezing: rather, it's meant to reduce destructive freeze-and-thaw cycles as much as possible. Ideally, the trees (rootballs included) freeze once and stay frozen until spring. 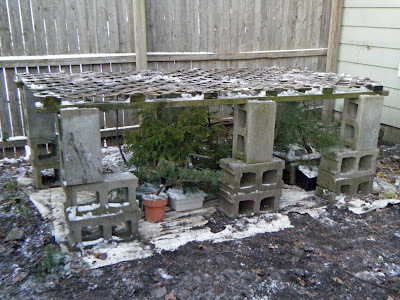 I've got some plans for a more permanent structure, for next winter. Stay tuned! I don't grow only bonsai. 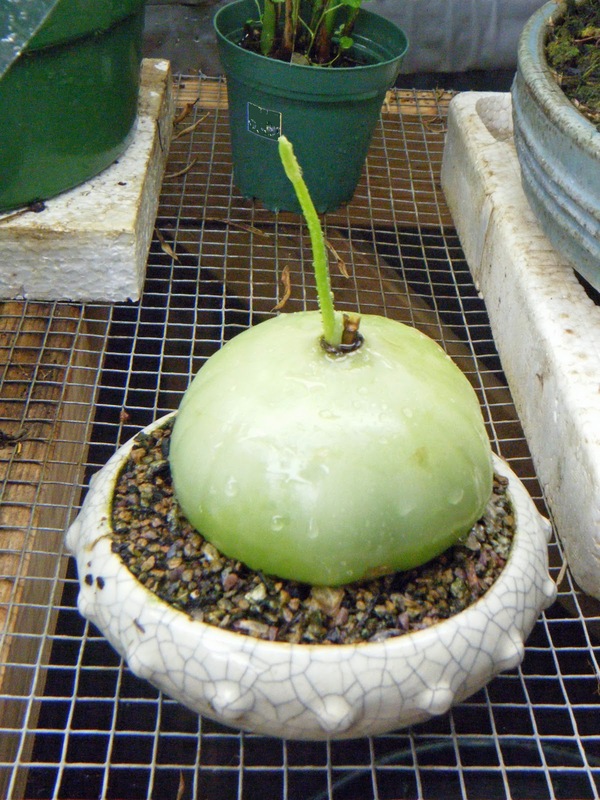 This sea onion, besides making a nice accent plant in a bonsai display, is an interesting critter in its own right. Sea onion (Bowiea volubilis) is not a true onion, tho, like true onions, it's in the lily family. Nor is it a marine plant: the "sea" reference comes from its particular shade of green. It is in fact a native of the tropical deserts and semi-deserts of southern Africa. Mine is just coming out of dormancy, and it's growing like a rocket: that new shoot grew 1-1/2 inches in less than 24 hours! I have certainly heard Will Benz's name, but must confess I don't know that much about him. I do know he was involved in bonsai for many years, and wrote a definitive book on bonsai display. The bonsai world is poorer for his passing. My prayers are with his family. 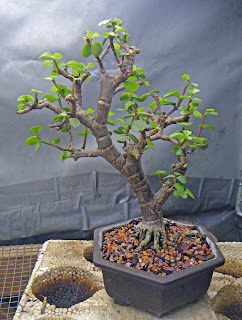 Back in August, I participated in Ryan Neill's Exhibit Critique at the 2011 Mid-America Bonsai Show in Chicago. Exhibit critiques are usually very valuable investments of time and money, and this one was no exception. I just finished re-participating, if you will, in part of the critique, thanks to the video clips that Paul Stokes took and has posted on his "ofBonsai" website. It was very worthwhile. Reviewing one's written notes is valuable (if the notes are good,) and I took plenty. But watching Paul's videos let me see the trees again, hear Ryan's comments in direct association with the images, and catch nuances that maybe got by me the the first time. Well worth the time! To enjoy these clips for yourself, go to: http://ofbonsai.org/galleries/videos/ryan-neil-exhibit-critique-midwest-bonsai-society-fall-2011-show-1. And if you find the clips interesting, please leave a "Thank you" for Paul. Yesterday I got the last of my half-hardy trees prepped and into their winter quarters. 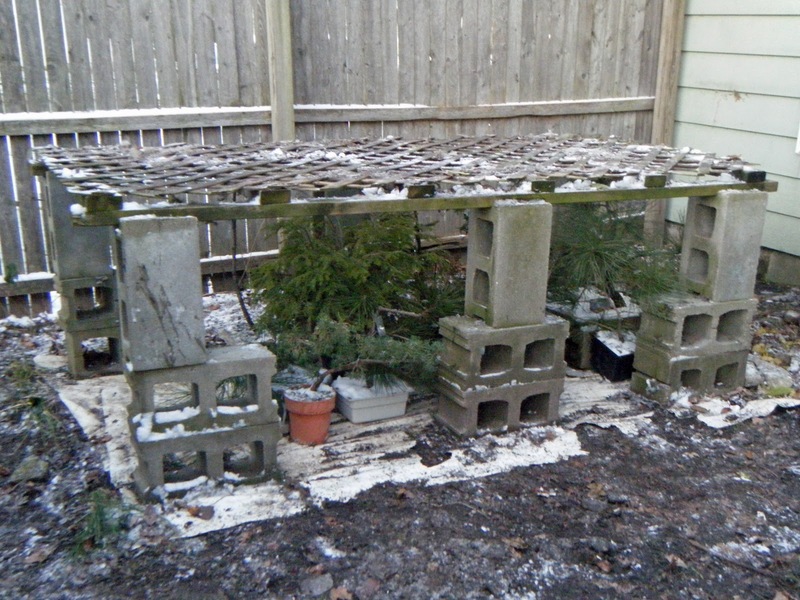 "Half-hardy" is the term I use for any species that needs a regular winter dormancy for long-term health, but can't survive a typical winter outdoors, with "normal" outdoor protection, in a given locale. Think about it a moment and you'll see that geography plays the major part in determining what is half-hardy for any bonsaiist. Winter quarters for my half-hardies is the "unheated mudroom" I described in my last post. I have a contraption called a Windowbridge (TM) over a south-facing window; there are two adjustable shelves on the Windowbridge. An inexpensive recording thermometer lets me keep track of daily highs and lows. 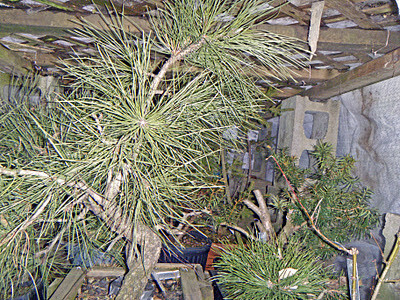 Japanese black pine is one of the classic species for bonsai, and deservedly so. But it is not fully cold-hardy here in northern Indiana.It's right on the knife-edge. In the ground, it survives just fine here; but put it in a pot, without the earth's insulation on the roots, and the outlook becomes a lot more iffy. I have only one JBP, for that reason. Two winters ago, I put it with my fully hardy trees, under a fabric cover in our sheltered back yard, and it did survive. But thruout the following growing season, it struggled. It was late to produce new foliage, and that foliage was very sparse. Growth was minimal.